What Does It Take to Become a Marine Corps Mortarman (0341)? A mortarman is a soldier who operates a firing device called a mortar. Mortarmen in the U.S. Marines are the unit that's mainly responsible for the tactical employment of the 60 mm light mortar and the 81 mm medium mortar. They provide indirect fire in support of the rifle and Light Armored Reconnaissance or LARS quads, platoons, and companies, as well as the infantry and LAR battalions. Mortarmen are located in the weapons platoons of the rifle and LAR companies and the weapons company of the infantry battalion. 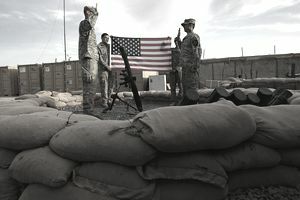 Noncommissioned officers are assigned as mortar gunners, forward observers, fire direction plotters, and squad and section leaders. Applicants must possess a GT score of 80 or higher. They must complete the Mortarman Course at the School of Infantry, East or West. Marine Corps Mortarmen can participate in the United Services Military Apprenticeship Program, commonly called USMAP. This official military training program offers active duty Navy and Navy Reserve Full Time Support (FTS) servicemembers the ability to enhance their job skills and to complete their civilian apprenticeship requirements while still on active duty. The U.S. Department of Labor provides the nationally recognized "Certificate of Completion" when the program is finished. USMAP gives you the opportunity to upgrade your job skills. It also shows your motivation for taking on more challenging military assignments. With the exception of the Coast Guard, the Marine Corps is the smallest military service. It needs to enlist only about 38,000 new recruits per year compared to the Army's average 80,000 yearly recruiting ​goal. The Marine Corps requires a minimum ASVAB score of 32 to enlist. In recent years, however, about 68.9 percent of all new Marine recruits have scored a 50 or above. The Corps recruiting regulation only allows about 5 percent of their enlistees per year to join without a high school diploma. The vast majority of new Marine recruits have a high school diploma plus at least 15 college credits. An applicant must score a minimum of 50 on the on the ASVAB to even be considered for a GED enlistment, and your chances are much better if you score at least a 90.